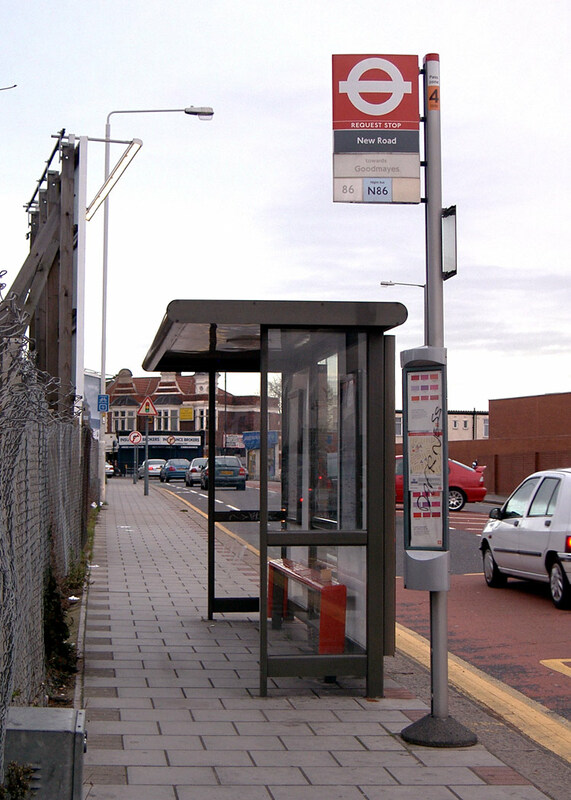 Realism suggests that transport is not always going to arrive 'just in time' for every passenger, so in addition to a recognised stopping point complete with proper 'BUS STOP' (or 'TRAM STOP') flags, seats, night-time lighting and information (real-time and other types) passengers need - not just "want" but NEED - a shelter designed for weather protection. 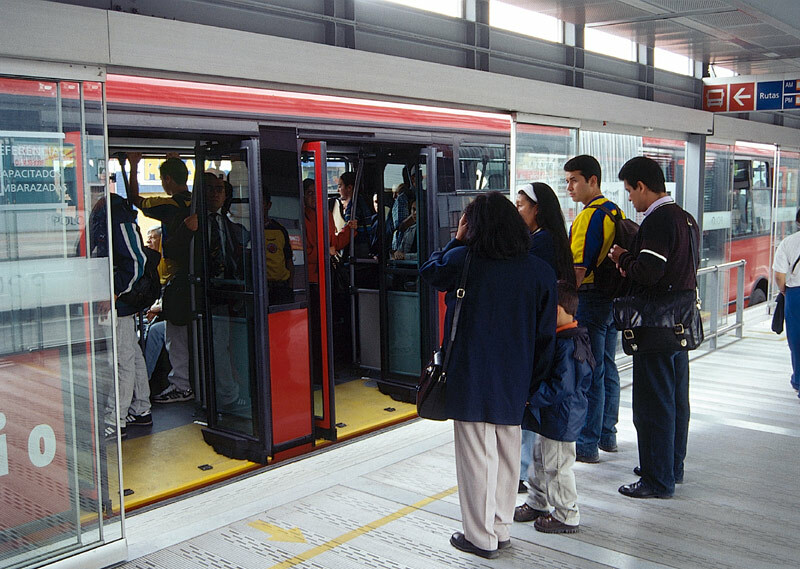 For two-way roads served by buses (trams) travelling in both directions these facilities should be on both sides of the road. Out & Back signs really should be discouraged - these may be OK for people with local knowledge but should public transport be only for those in the know? The only exception to this rule would be for local hail and ride services for which buses will stop anywhere (safe) along the route. 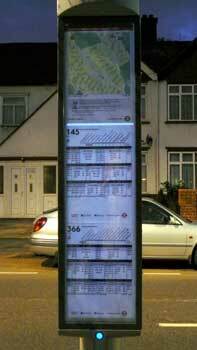 For these perhaps some street lamp-posts could be used as extra information points. 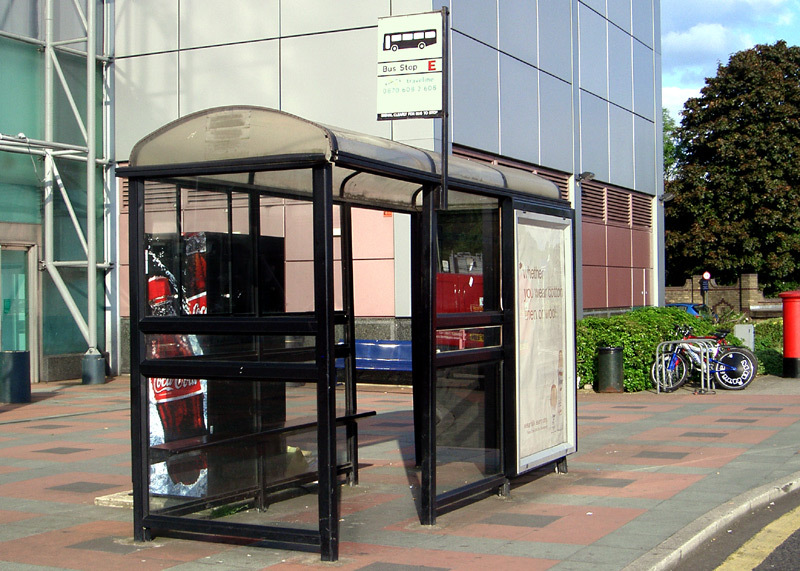 Admittedly there is sometimes a problem with vandalism of transport stop / station shelters (etc;) but this is a problem for society to deal with. 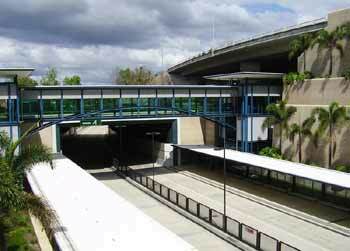 It should not be an excuse for good passenger facilities. Perhaps there could be a case for bringing back the stocks for the worst cases of wanton vandalism? - backed up with community service and education to try and instill into these criminals a sense of responsibility towards their fellow humans and public property. A thorough investigation of their food consumption could also be of benefit, as certain food additives, colourings, etc., can negatively impact upon people's behaviour. These thugs could also be made to contribute (financially) towards the cost of repairs, although how much would depend on their personal finances and the crimes they committed. There is also a need for society to face up to the fact that too often it de facto 'encourages' (young) criminals through lenient justice. Especially youngsters are very good at knowing their rights - but are they ever taught their duties? 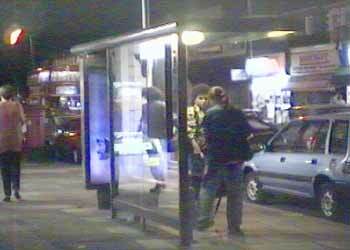 In Britain it is now illegal to smoke in street-based bus (& tram) stop shelters. This law even applies to open-sided shelters, with them being categorised as "enclosed public spaces". The reason for this is to ensure that non-smoking passengers are not forced to inhale other people's smoke. Both people caught breaking this law and organisations which fail to enforce this law can be prosecuted, and fined. 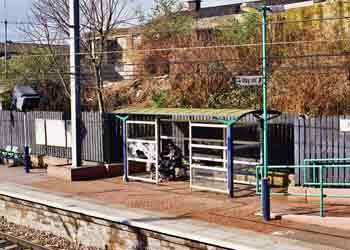 Smoking was already prohibited at many railway stations - including platforms and waiting rooms - as well as on (most) trains and buses, so extending the regulations to street-based street-based stop shelters could be seen to be have been a logical next step - although people who smoke may think otherwise. 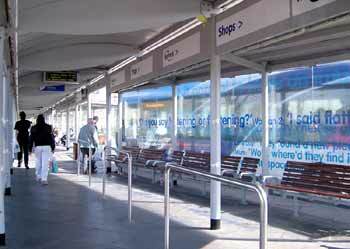 It cannot be emphasised enough that passengers do appreciate weather protection!. In reality this means fully enclosed waiting areas, although especially for street-based bus and tram stops space constraints mean that this is not always possible. Too often shelters are designed with "visual appeal" being the primary design feature and whilst visually attractive street furniture is of importance (both for enhancing the "image" of the transport and the overall street / railway station scene) what really ought to be of upmost primary importance is functionality - ie: protection from rain, sleet, snow, etc - which in windy weather might be falling at an angle. Transport operators / planners etc., must remember that if they want to attract people who have a choice in their modes of transport (public or private) to use public transports then it is simply not good enough to expect potential passengers (on wet, windy days) to meekly accept "a soaking" whilst waiting for the transport to arrive. Getting soaked in this way is most unpleasant - and will provide many potential passengers with a good enough reason for choosing to "travel by car" on their next journey. 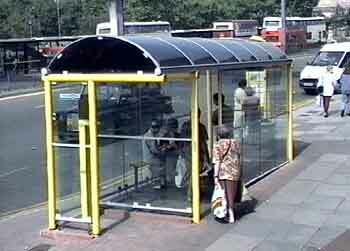 Where space allows fully enclosed bus stops - complete with plenty of seating - really needs to be universal and not just for 'high profile' bus services as here in Liverpool, England. 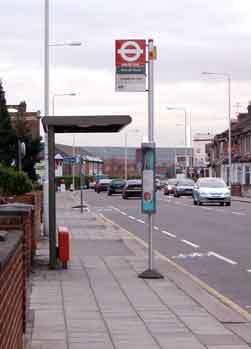 The separate area nearest to the camera is for a public telephone. 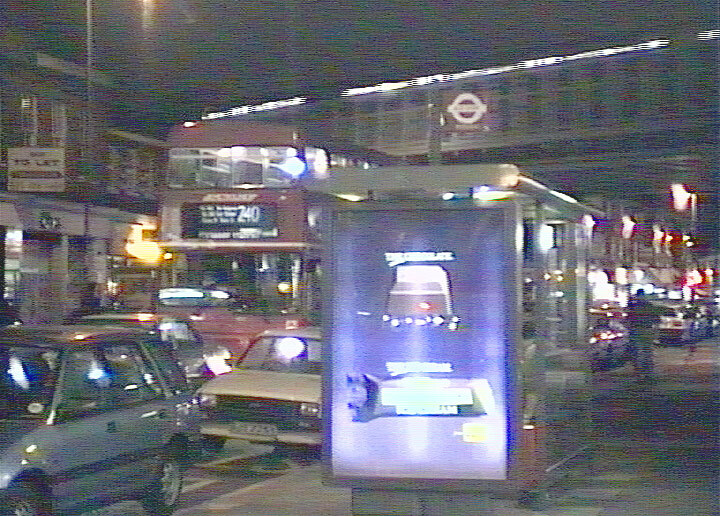 NB: Image is sourced from S-VHS-C videotape and the clickable larger version is a little fuzzy. An airconditioned bus stop in Dubai, UAE, where the temperatures are best described as 'seriously hot' and airconditioning is not just a mere luxury. 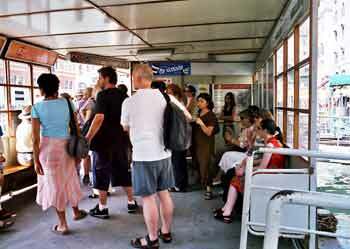 Other features which can make the overall journey experience more pleasant and therefore passengers might expect at bus / tram / railway (etc) stops and stations will include seating, route information (both a timetable & a map) and in the present-day technological era, real-time information. These are looked at on the main Stops and Stations page. 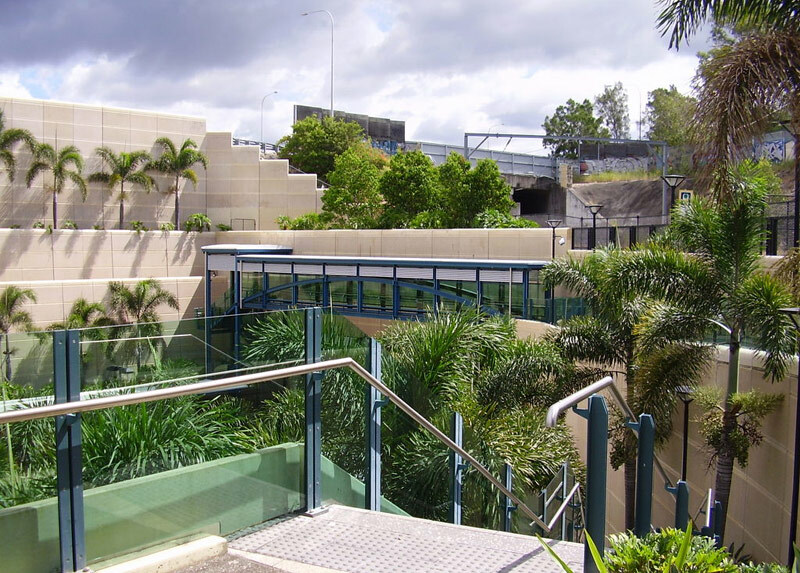 Although clear glass is the preferred glazing option (it is much more visually appealing!) 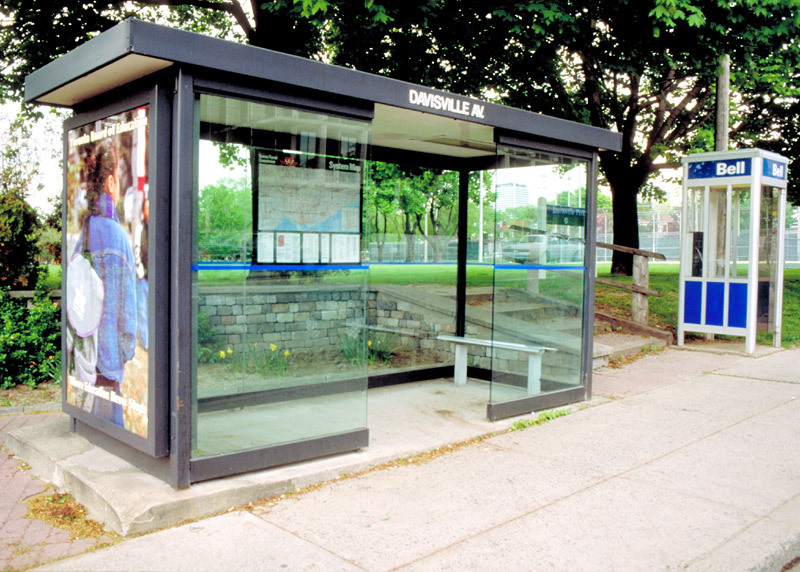 many shelters feature a form of unbreakable plastic which unfortunately is much more prone to showing marks - especially scratching. The real issue here though falls back to human mis-behaviour - too often transport providers would use better quality materials if only there was less vandalism. Replacing smashed glass at bus stops is an expensive business - especially as for reasons of safety special toughened glass is usually used. Obviously the shelter cannot block the footpath, so as not all footpaths are wide enough for full shelters even a "side plus roof" is better than nothing. Note how to provide space for the foundations without encroaching upon the householder's garden wall the shelter on the left is set back slightly from the wall. 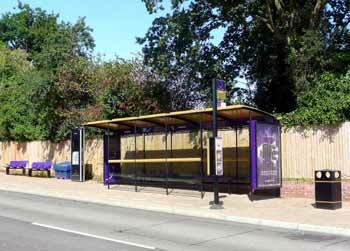 whilst for safety reasons the other two shelters are about 18" (45 cms) from the kerb. This is to provide safety space for a person should a road vehicle (or arriving bus) pass too close to the kerb whilst a person is standing on the "road" side of the shelter - otherwise they risk being squashed - something that is best avoided!!! 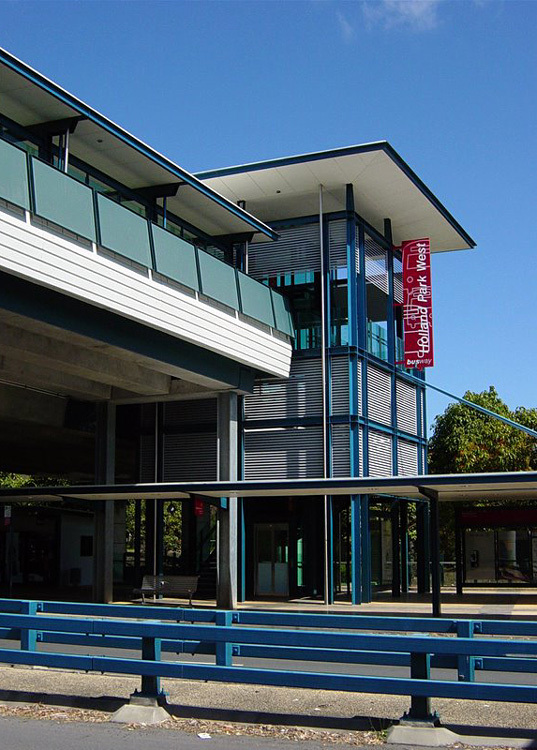 A compromise between maximum shelter and better passenger access sees some shelters having two openings. Sometimes they will both be along the same side, at other times they may involve staggered openings on opposite sides or the second opening might be at the opposite "end" of the shelter. There are no fixed rules - often it depends on what the organisation responsible for the shelters deems to be appropriate - or can afford. 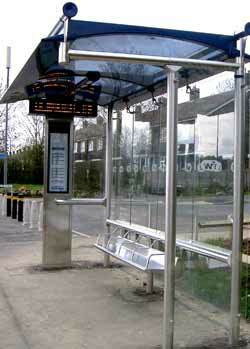 It is rare for these types of street-based bus (tram) shelters to be fitted with entrance doors. 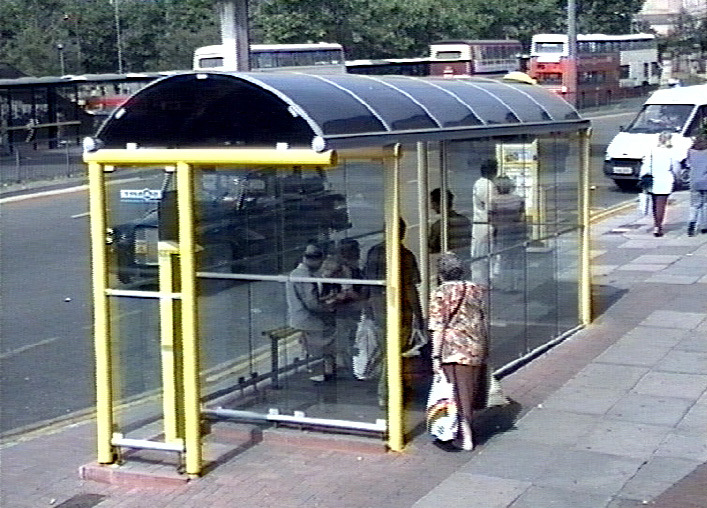 It could be said that with their smaller, staggered openings these shelters provide better weather protection - albeit at a price of being less visually attractive than the 'glitzy & shiny' modern examples seen several rows below. The shelter on the left has two openings on one side (which here also extends over the corners too) with a solid panel between, whilst the shelter on the right has openings on opposite corners - so effectively this view is looking straight through both openings. This shelter from the iXpress express bus route in Waterloo, Ontario, Canada features larger side panels as well as front panels - and visual æsthetics more on par with the 'glitzy & shiny' modern examples seen several rows below. Image & license: Dmitry Denisenkov (Canwolf) / Wikipedia encyclopædia. 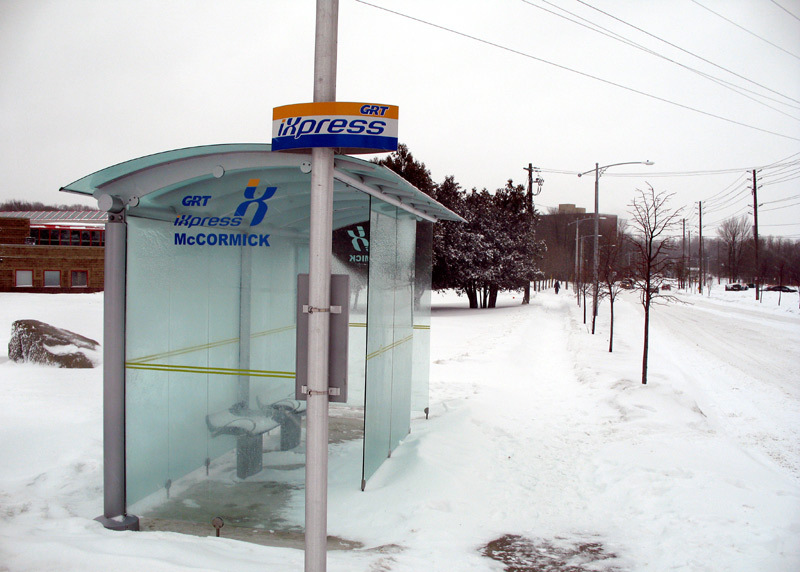 CC BY-SA 2.5 http://commons.wikimedia.org/wiki/Image:IXpress_bus_stop.jpg This Toronto, Canada, shelter features just a single opening, and to improve access is set back a short way from the kerb. 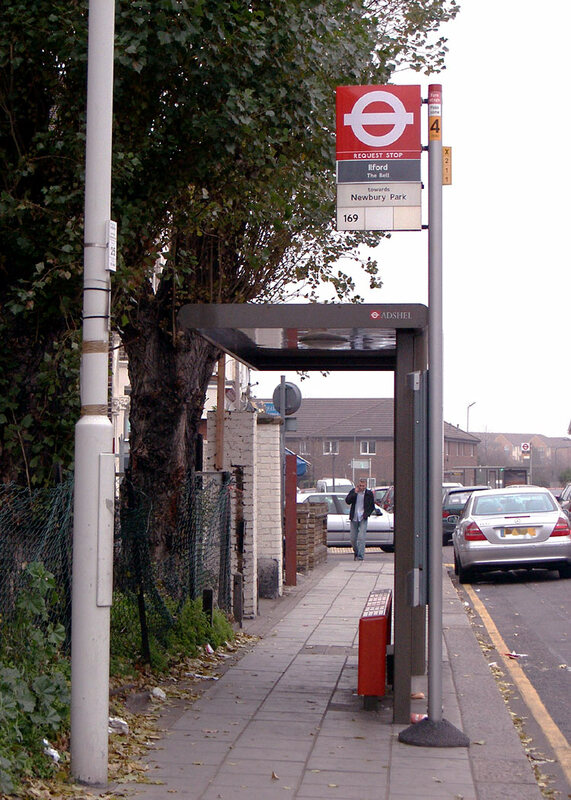 To make it easier for regular travellers to find their bus at larger bus stops / stations which are served by many buses the buses will often be allocated specific bays (or bus stops) at which to call. The bus station at the Bluewater shopping centre just outside of London in north Kent, which has been laid out in a 'saw tooth' pattern. 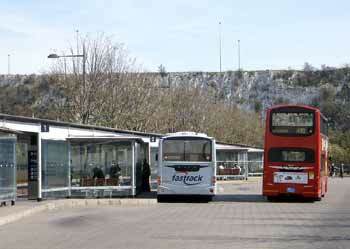 These images show buses from the 'Fastrack' BRT system as well as a bus from one of the several 'red' London bus routes which also serve this large prestigious shopping centre. 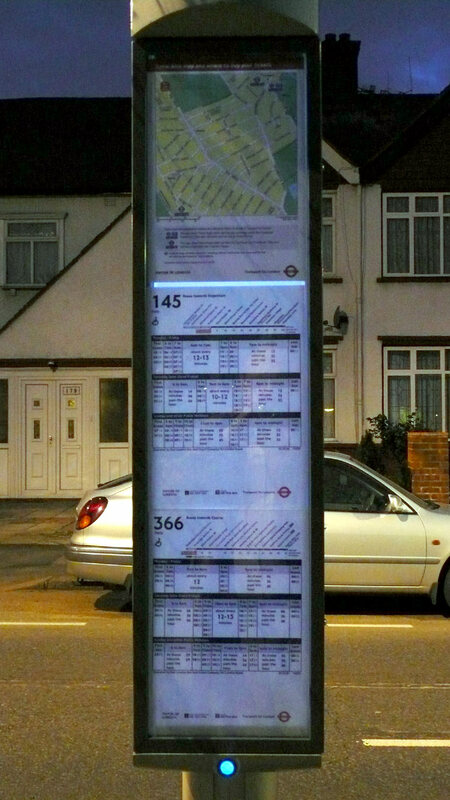 Also visible in these images are the signs indicating the destinations served by the buses which call at this bay, seating and a real-time information display. Street based bus stop with (virtually) fully enclosed shelters laid out to a saw-tooth design in Liverpool, England. 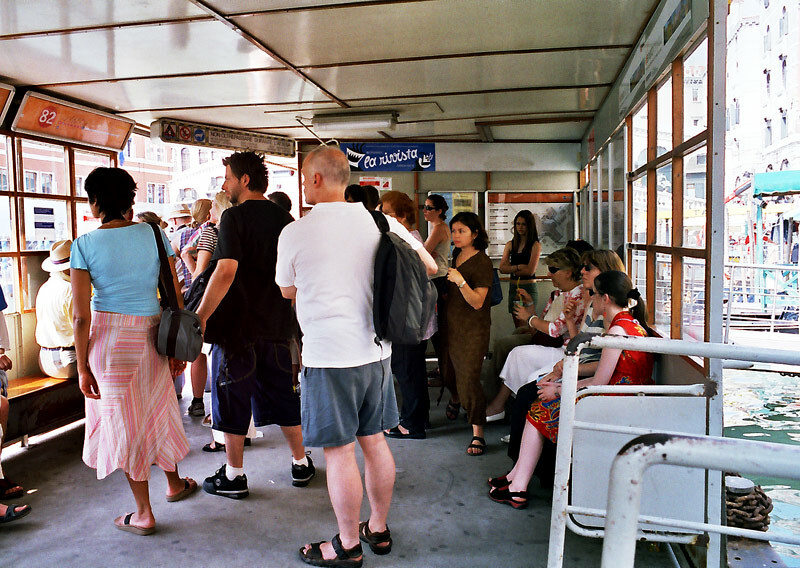 Fully enclosed waterbus waiting room on a pontoon in Venice, Italy. The distinctively styled bus/tram station at the Centro shopping centre near Oberhausen, Germany. 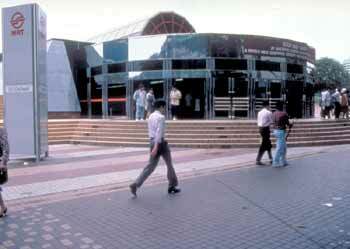 Unfortunately the need for ventilation for the fossil-fuel powered motor buses means this station can be very draughty and cold in winter. At night lighting can help instill a sense of security, whilst commercial advertising should help defray the cost of upkeep. These images were sourced from S-VHS-C videotape and the clickable larger versions are a little fuzzy. 'bus-stop-night-multiple320.mpg' showing the actions being described . In London many bus stop 'flags' and information panels on the flag poles benefit from solar powered night time illumination. 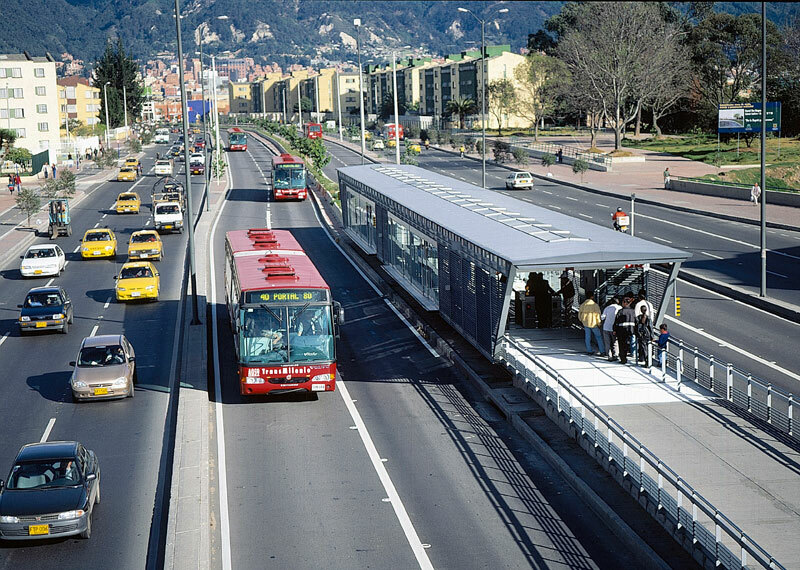 Bus Rapid Transit (BRT) is a broad term which is often understood to refer to a type of bus service which through improvements to infrastructure, vehicles and scheduling, attempts to provide a service that is of a higher quality than a so called 'ordinary' bus service. 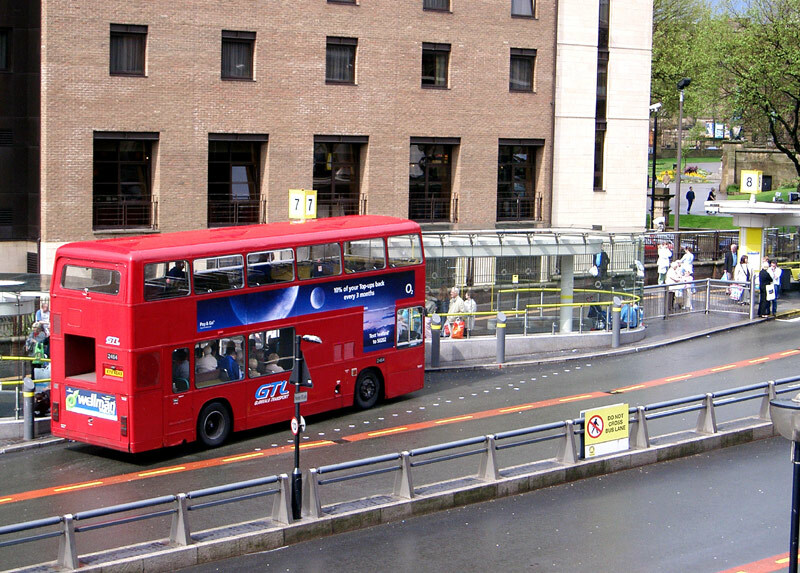 In recent years several BRT systems have commenced operations here in Britain, albeit under other marketing labels. They have been introduced with a specific aim of creating new, high quality idioms in bus transport and are proving to be reasonably successful in achieving this aim. In many ways there has been an aim of emulating the known popularity of modern light rail / trams, although unfortunately as long as fossil fuel buses are used it will remain an impossibility for them to achieve the same environmental standards as trams. 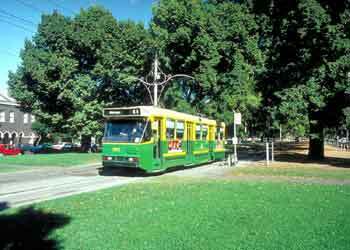 Only pure electric trolleybuses share the same zero tailpipe emissions / 'clean air' attributes as trams - not low-emission motor buses, nor hybrid buses - the latter may have an electric drivetrain but they also use fossil fuel engines so are still motor buses. 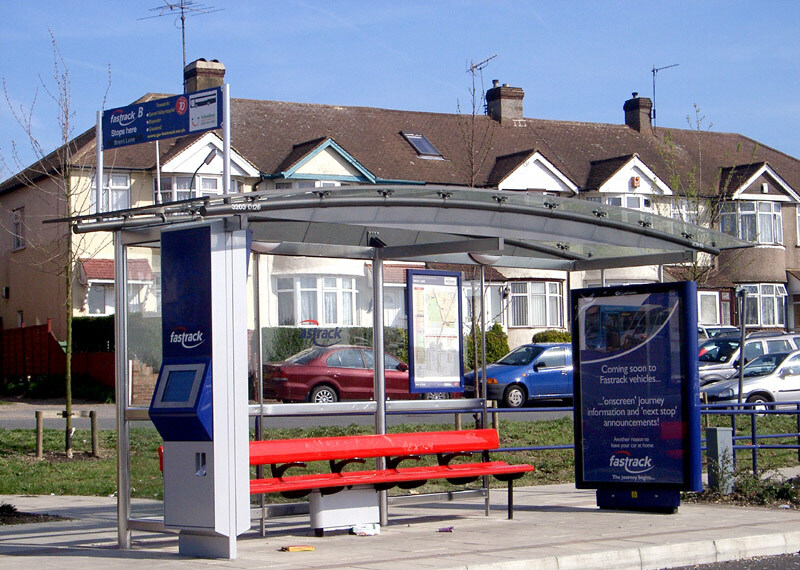 Unfortunately however an area where the planners seem to be missing the mark is that whilst the BRT systems include the use of modern distinctively styled bus shelters, too often they opt for designs which put 'glitzy & shiny' visual impressions ahead of weather protection. Despite being in a location where there is space for a something more effective this distinctively styled modern shelter is more typical of those designed to impress people by looking 'glitzy & shiny' rather than for the rather important task of weather protection. 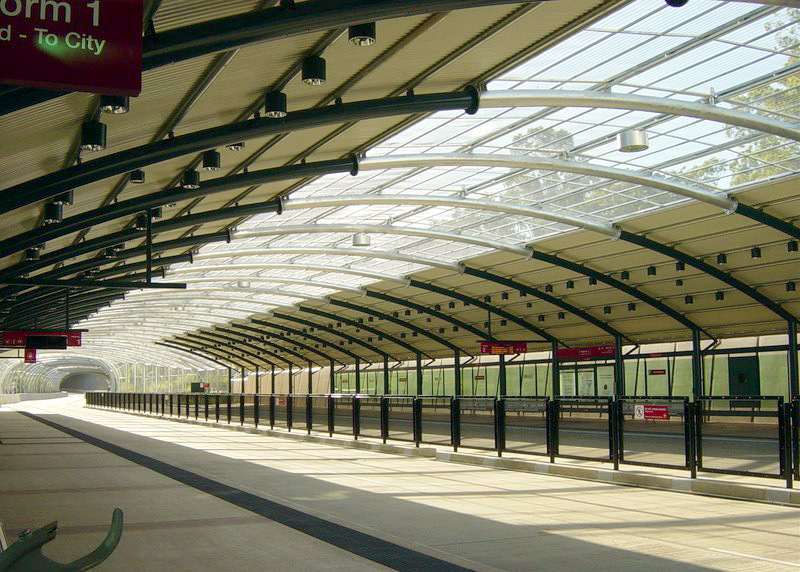 In addition to a roof it features half-screens on the two ends plus one side wall - a package which all in all offers only a very limited amount of weather protection - especially against blustery rainy conditions. 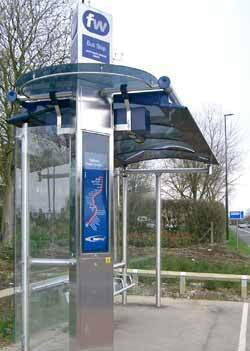 This modern shelter comes from a different British BRT system and features fully open sides and a styled top. 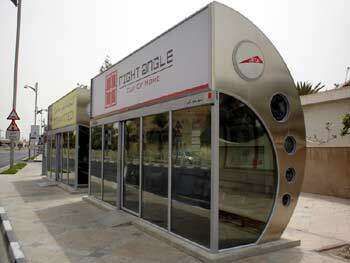 This modern shelter comes from yet another British BRT system. The opening at the back is unusual - it reflects the direction from which many passengers arrive / depart, not all shelters on this BRT system include this opening. The aim in these comments is to advocate proper weather protection for waiting passengers. 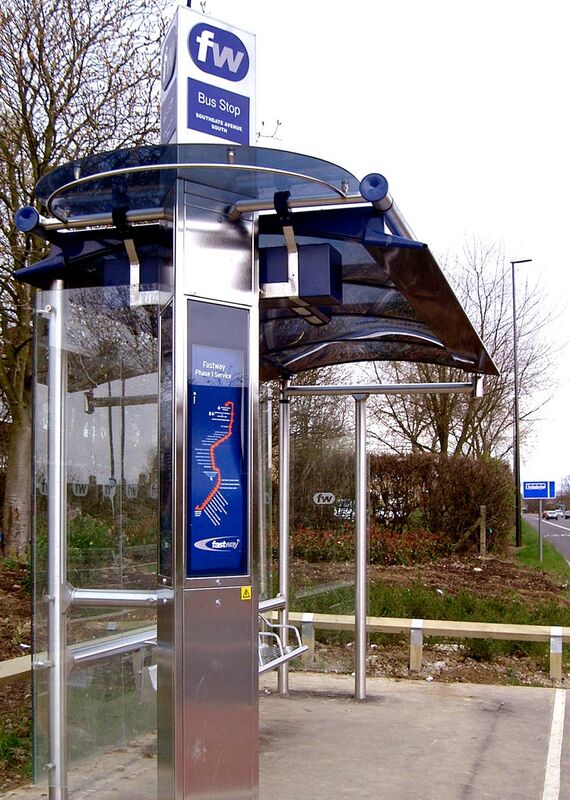 No-one likes to receive a soaking in wet windy weather conditions - knowing that the wait for the transport will be in a dry, weather-protected environment will help encourage potential passengers to use the bus - rather than their car. It is difficult to see how anyone can be attracted to a 'glitzy & shiny' waiting environment where open sides mean that even the seats and inside walls are dripping wet from blustery rain. This modern shelter includes front panels and although the sides are still partially open passengers waiting here on a cold windy day have a greater chance of being protected from the cold wind. 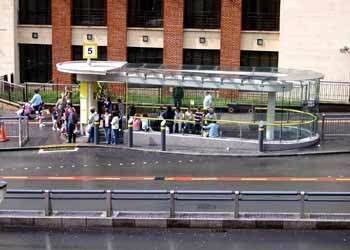 In South America the BRT systems tend to feature more substantial / fully enclosed 'passenger station' style bus stops. 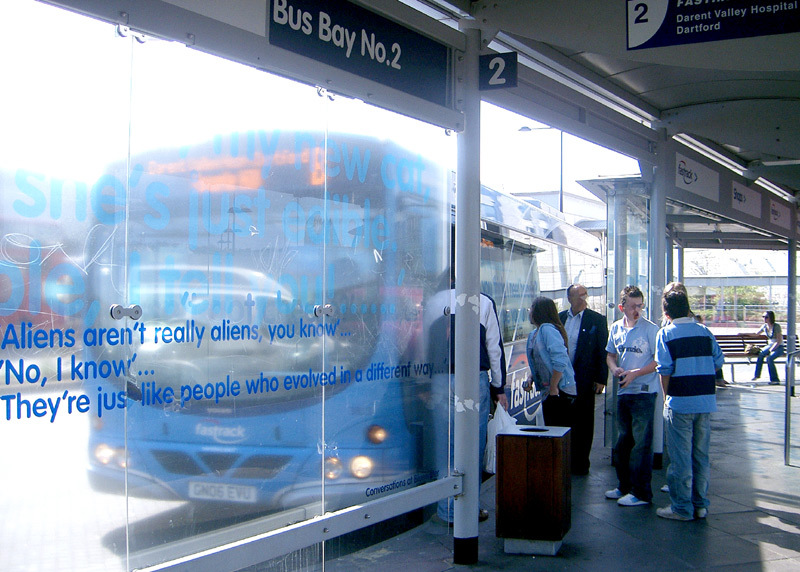 Typically passengers will be expected to pay their fare when they arrive at the bus stop and before the reach the 'platform' (just like railway stations) so that when the bus arrives they can board it through any of the many entrance doorways. 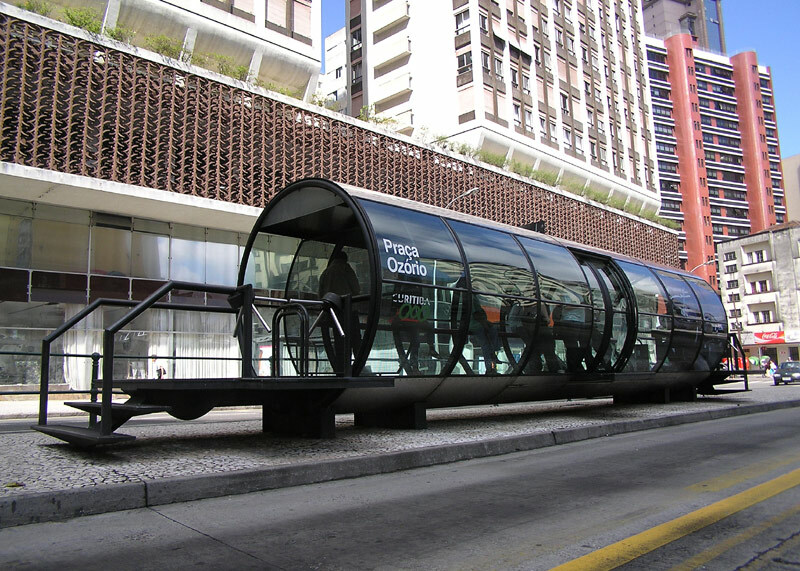 A high-platform, tubular, street-based BRT bus stop in Curitiba, Brazil. Note the elevated bus stop platform. 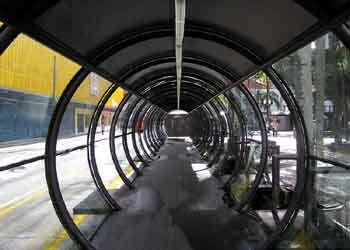 commons.wikimedia.org/wiki/Image:Bus_Stops_2_curitiba_brasil.jpg Inside one of these distinctive 'tube-stops'. 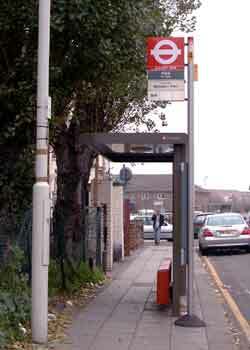 A side elevation of one of these distinctive 'tube-stops'. 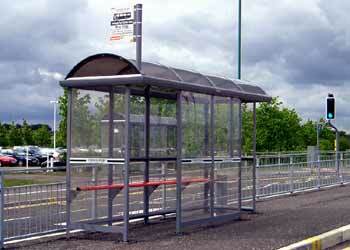 A fully weather-protected waiting environment! 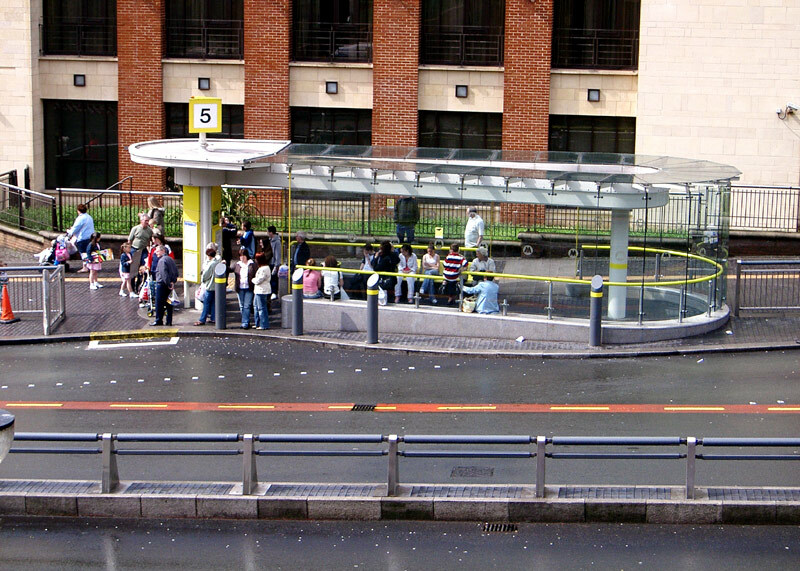 http://commons.wikimedia.org/wiki/File:Tubo_Curitiba.JPG On arrival at the bus stop step-plates are lowered from the bus to bridge the gap between each set of passenger doors and the bus stop platform. The resulting level entry both helps reduce stop dwell time and make the vehicles more accessible to 'special needs' passengers. 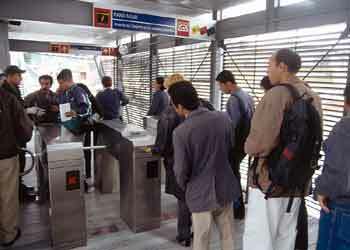 Another (of the several) South American cities with high profile bus-based rapid transit systems is the Colombian capital Bogatá. These four images show a fully enclosed shelter on the 'TransMilenio' BRT at a passenger station which is located in the median of a dual carriageway. 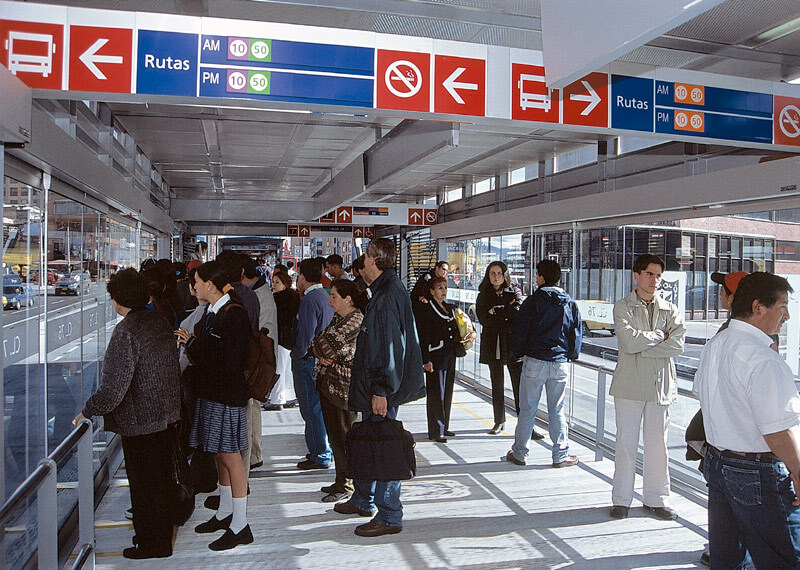 As with Curitiba passengers pay their fares at the entrance to the shelter, so that when the bus arrives they can rapidly board at all doors. Images sourced from bus manufacturer's promotional material. 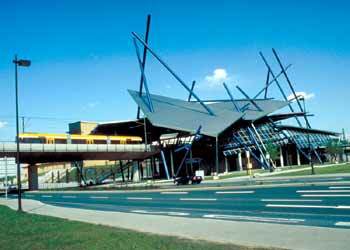 In recent years several Australian cities have been investing heavily in BRT systems, with 'bus stops' which are as grand as railway stations. 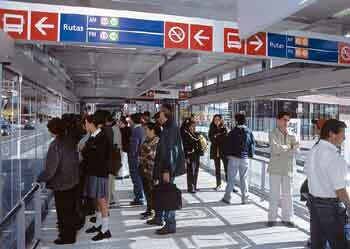 The images above and left show stations on the South East Busway. 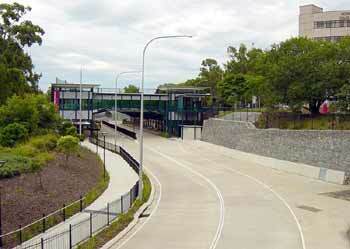 The images below show the RCH (Royal Childrens Hospital) Herston Station on the Inner Northern Busway. 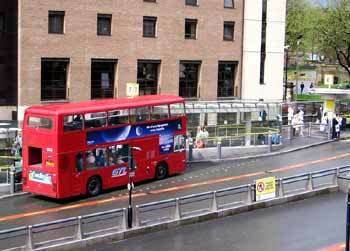 Immediately after the station is a wire mesh 'cage' to protect the buses from the balls of a nearby golf course. Images courtesy of Aussie Bhoy. Reproduced here with permission following their publication on a thread named Mixed Brisbane Transport Pictures at the www.skyscrapercity.com group of forums. With light rail the stop type can vary depending on location being served. For older tramway / streetcar systems the facilities will often mirror the cities' bus facilities (which unfortunately can mean precious little) however especially on segregated sections of newer lines the stations can be as grand as any mainline railway station. Depending on the locality, and whether the service is 'new' or 'pre-existing', light rail stops will usually be between 200 metres and 800 metres apart. 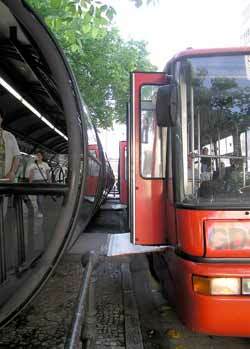 That will often be further apart than bus stops but closer than heavy rail / métro stops. Melbourne, Australia, the simplest of halts - literally just a footpath and a 'stop' flag located next to the tracks. Note the ornate overhead wire mast and bracket arms. 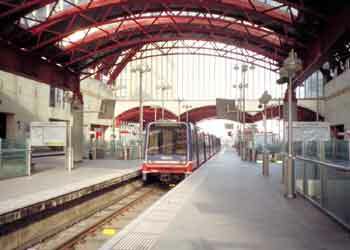 Canary Wharf Station on London's Docklands Light Railway. 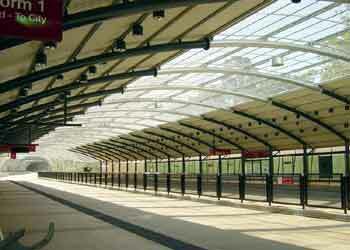 This very busy station features three tracks, each of which is flanked by two platforms. It is located in the heart of the skyscrapers' bustling retail area. 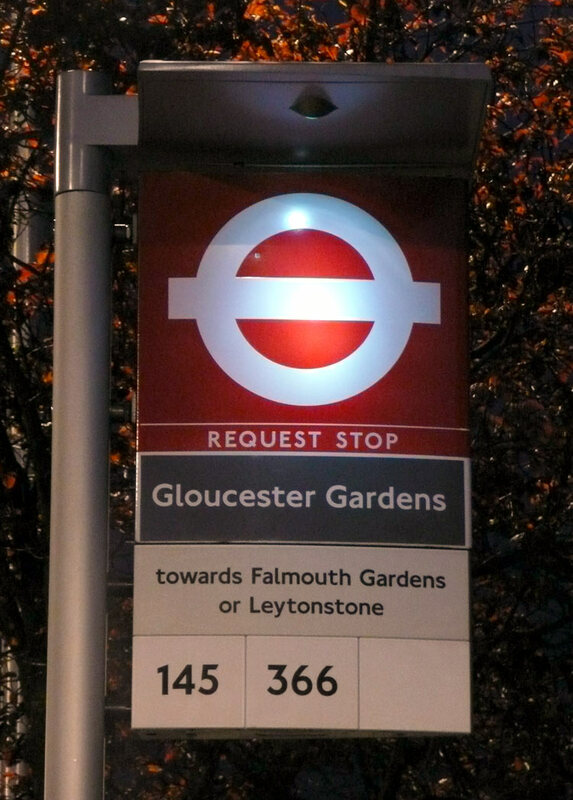 Especially on newer systems it is usual for all light rail stops to have a name - this follows european transport philosophy where it is also usual for bus stops to be named. Typically the name will be a local landmark, pub, side road, etc. 102nd Street Station, Portland, Oregon, USA. 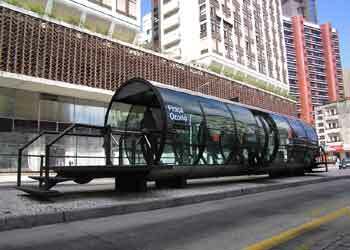 Of all the new light rail systems visited for these pages Portland has the best 'stops'. Why? Because instead of the flimsy European-style "arty crafty" minuscule passenger shelters Portland provides proper weather protection for its waiting passengers. 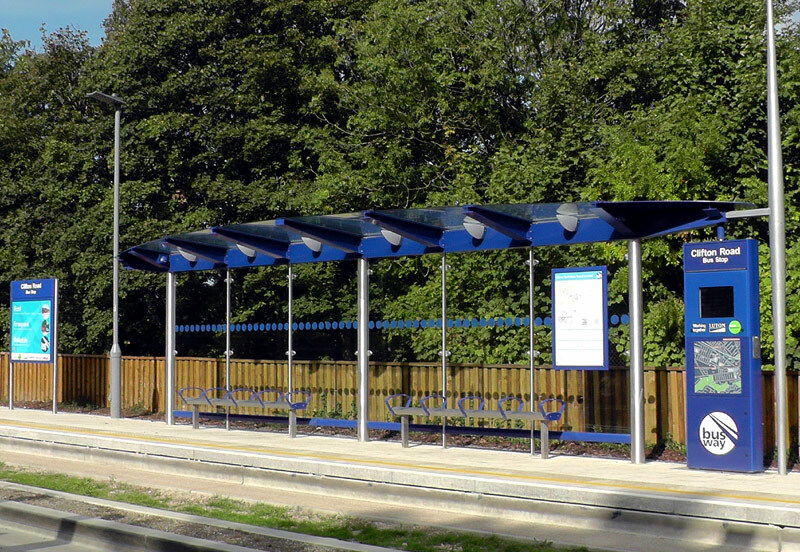 This shelter is typical with plenty of covered waiting space which is enclosed on 3 sides for maximum weather protection within the available space, plus proper seats too. 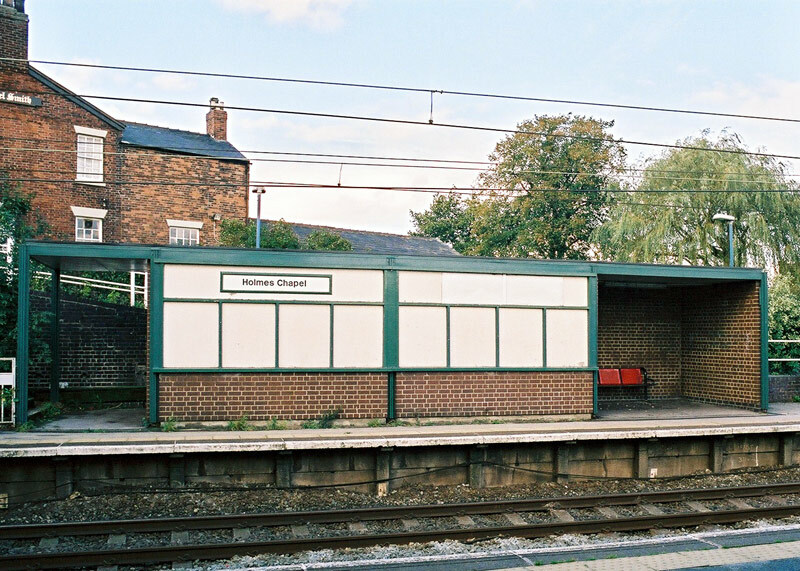 When built many mainline railway companies took pride in creating stations which featured waiting rooms (heated in winter) and platform awnings designed to provide weather protection as well as 'be visually pleasing'. 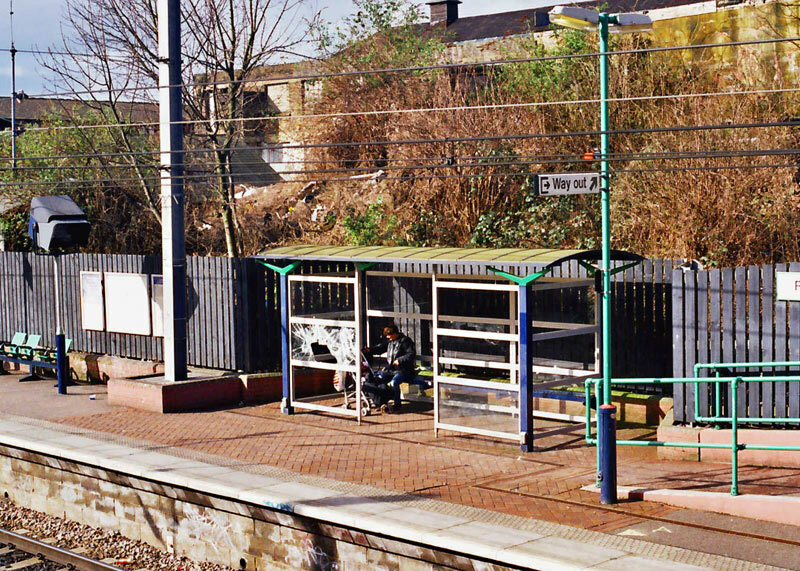 Over the intervening years many of these stations have been allowed to decay so that eventually the structures were removed - and if replaced then with tiny 'bus-stop' type shelters which unfortunately only provide a few people with very limited shelter. 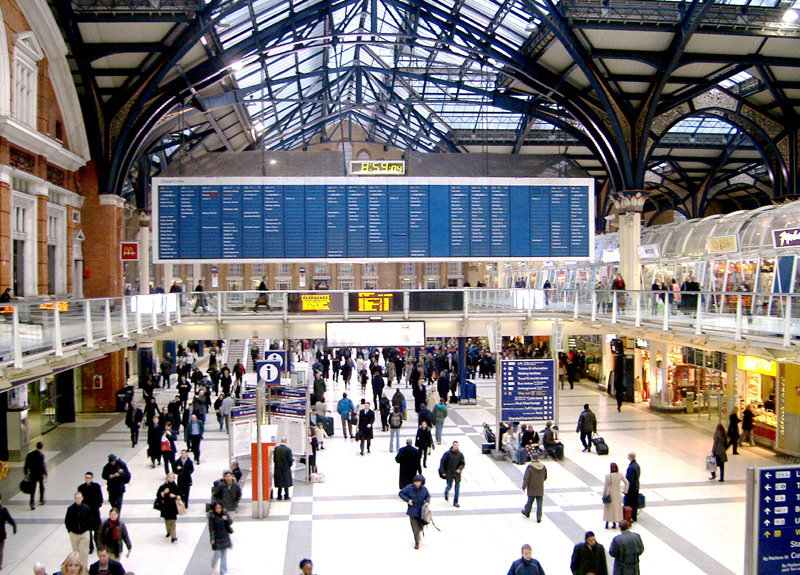 Part of the problem is that in the name of (false) economy stations became unstaffed and with no-one watching vandals would wreck the place so that whilst some transport operators would like to provide better facilities vandal resistance has become as (if not more) important than the passengers' needs. Clicking either of these images or clicking here will open a dedicated page showing larger images - including the inscription on the waiting room window - in a new window . As an aside, since these photographs were taken the station has been refurbished and in an act of wanton vandalism the etched glass windows were replaced with plain glass. 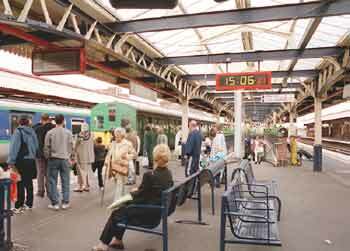 A busy scene at Romford in Essex. 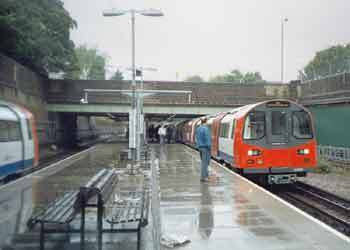 This station retains its original full-length platform awnings on four (of the five) platforms, so even when it is raining the passengers have a pleasant dry place to wait for their train. 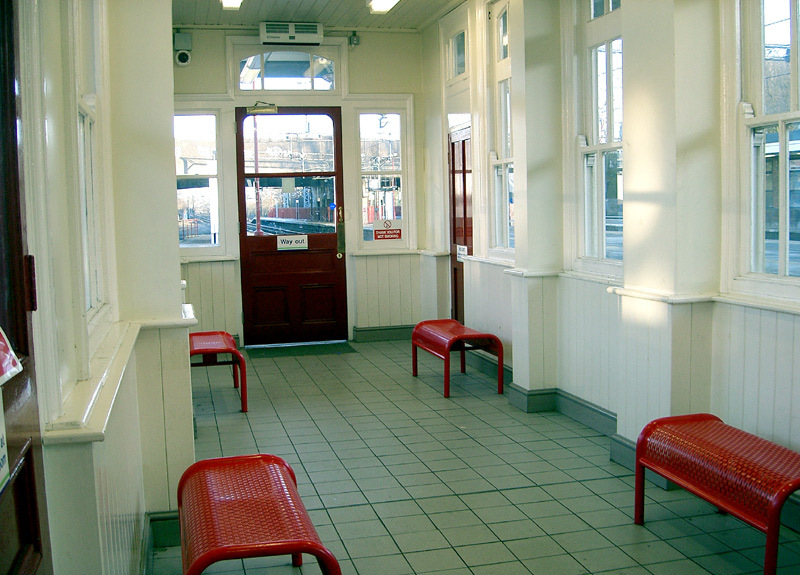 Note the provision of seating for waiting passengers. Inside a waiting room - the weather was deceptive as despite the bright sun there was a bitterly cold wind, so with there being 20 minutes before the train was due being able to wait in a heated, sheltered environment was a true blessing. 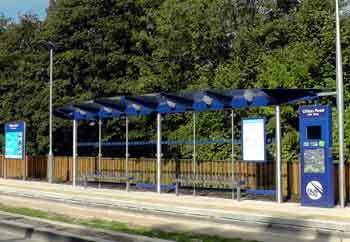 This 'bus-stop' type shelter is rather small for a railway station but still offers more protection than many of the bus shelters seen on this page. 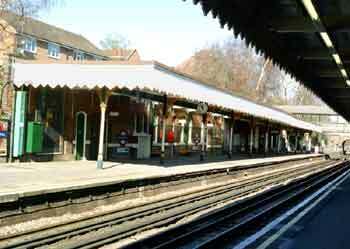 It is located at Finchley Road & Frognal station on the North London Line, a now thriving but once run-down railway route that in the 1960's Dr Beeching listed for closure. Holmes Chapel station in Cheshire; a small unstaffed village station which features modern 1960-era platform facilities. 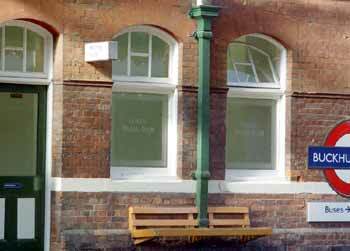 Sadly because of repeated vandalism the waiting room is closed with all its windows boarded up and the cycle facilities are unused. An underground railway station entrance in Singapore. 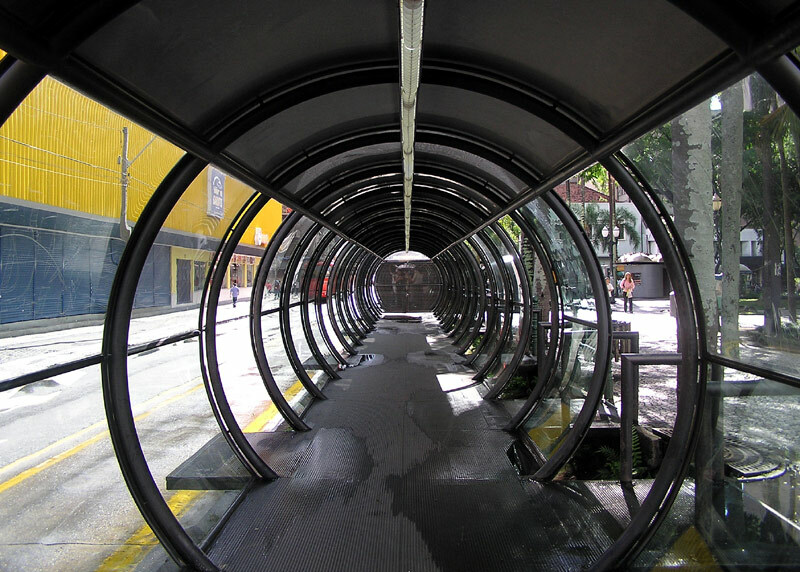 To avoid water entry during a heavy rain storm all stations (and all other passageways below street level) feature raised entrances. Only a third of London's Underground is actually below ground - much of the platform at this 1920's built station is left unprotected. 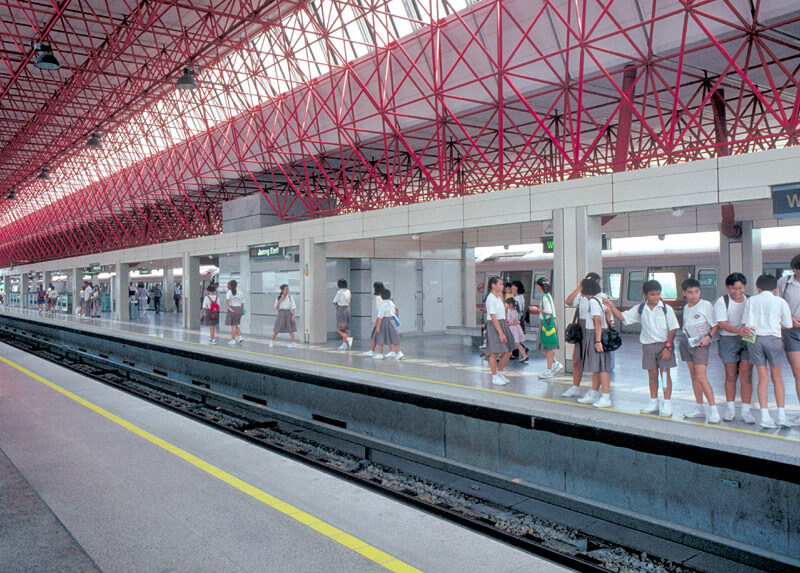 The impressive Jurong East station in Singapore where all platforms benefit from the modern overall roof - seen before the fitting of platform edge doors. 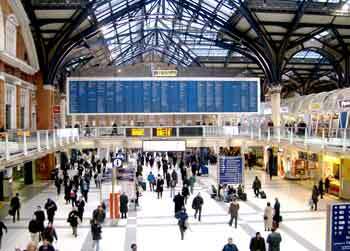 London Liverpool Street Station was modernised in the late 1980's but to comply with planning regulations had to retain much of its historic vaulted 'Cathedral-like' trainshed roof. 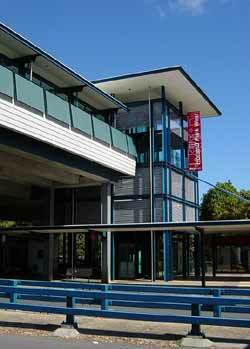 Historic stations - the challenge of meeting modern-day needs! Return to Main Halts, Stops & Stations page.